We all know daily stress can cause a myriad of health problems like depression, high blood pressure, skin disorders and even heart-related issues. Even more surprisingly, your stress levels could also be affecting your dental health. Stress related dental problems were known to ancient societies thousands of years ago and the pattern hasn’t changed. Here at Salmon Creek Family Dental, we understand how stress can affect your oral health, and we’re happy to offer advice on how to prevent the worst. Over the last 30 years dentists have successfully decreased tooth decay in Americans by nearly 70 percent through the aid of regular cleanings, fluoride treatments and educational awareness. However, now, findings show that tooth decay may not be caused merely by poor dental care, but by stress itself. When the body is stressed, it increases the secretion of the suprarenal glands, which produce the front-line defenders against bacteria and germs. This over use of the foreign body fighters means they can become lazy when real bacteria is introduced into the body, meaning your body is less likely to ward off infection. Your gums are the first to be affected, showing signs of bleeding and swelling more than those that are not susceptible to stress. As stress levels increase in our bodies, our mood changes constantly causing mood swings and depression. Both can lead to poor decision making when it comes to oral care. Some people may start skipping the important daily dental regemine. Brushing and flossing are key to ultimate oral hygiene, and skipping them, especially during periods of high-stress could be detrimental. Further, when the body is overly stressed the tendency to develop bad-eating habits are heightened. This could include over-snacking or consuming overly sugary foods or drinks. People suffering from long-term stress are more susceptible to gum disease. Some may notice excessive gum bleeding, redness and/or swelling. Ignoring these issues by not flossing or consulting your dentist leads to further problems like plaque and eventually tooth decay. When plaque gets out of hand and cleanings alone can’t solve the problem, cavities form and the teeth are in danger of rotting and or nerve damage. Perhaps one of the most common dental-related issues associated with daily stress is teeth grinding or clenching. Nearly 40 million Americans suffer from bruxism and studies have shown that the ailment is caused by stress or age. Teeth grinding typically happens while you’re sleeping, but teeth clenching can happen during the day without you even being aware of the condition. Excessive teeth grinding or clenching can lead to TMJ, or the misalignment of the jaw joint which causes popping, difficulty chewing or the inability to open and close the mouth properly. Stress doesn’t have to take over your body. Learning how to relax in your daily life is your first step to healthier living and a healthier mouth. Further, a visit to Salmon Creek Family Dental is the best way to determine if stress is affecting your oral health. We can detect early signs of gum disease, mouth sores, teeth grinding and orafacial pain and also assist you in learning how to deal with stress better and offer you advice and resources. 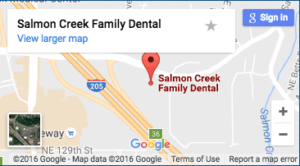 Feel free to contact us here at Salmon Creek Family Dental, your cosmetic dentist in Vancouver, WA, with any concerns or questions you may have about the health of your teeth. ← Clean Your Teeth While You Eat!